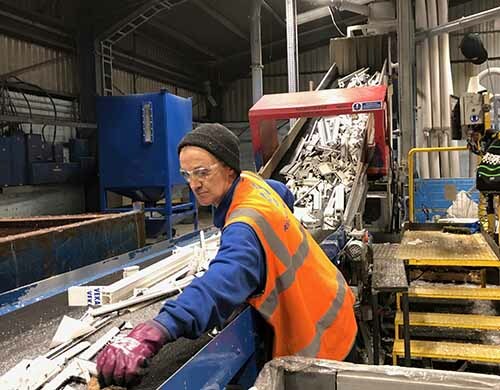 Veka Recycling, the recycler of PVC-U post consumer window profiles, has begun full production at the company’s brand new headquarters site in Wellingborough, Northamptonshire. From acquisition in February of the 5.5 acre site on the town’s Finedon Road Industrial Estate and after undergoing a substantial refurbishment, rebuilding work and industrial fit out, the facility is now converting full loads of virgin, post consumer and industrial profiles into high quality PVC-U compound. Further investment and development during the next 12 months will further extend the capabilities and capacity of the plant, to become Europe’s most advanced specialist windows recycler. “We are very pleased with the progress we have made at our new site,” said Veka Recycling Managing Director Simon Scholes, who has managed the project throughout. “It took many years to find what is the perfect site for our requirements but we are on schedule to build a facility that will be totally self-sufficient and capable of recycling in excess of 25,000 tonnes per annum by the end of 2019.” Current capability allows the plant to accept previously installed frames as well as virgin offcuts, reduce them and then transfer component materials for further reduction and separation. PVC-U is then further processed at Wellingborough and returned to market for re-manufacture. New products produced using Veka recycled compounds include new window profiles, cills and trims as well as products as diverse as electrical conduit and construction components. When the plant is fully operational all materials will be extracted and re-processed on site. The Wellingborough plant will be the third to be built by Veka Umwelttechnik GmbH, the specialist recycling subsidiary of the Veka AG Group, of which Veka Recycling is a wholly owned division. The company has pioneered PVC-U recycling in Europe with its first plant opening in Behringen, Germany as long ago as 1993. A further facility was opened in France in 2006. The combined capacity of the three plants will exceed 100,000 tonnes of PVC-U windows a year. “Veka Group made the commitment to invest more than £8 million at Wellingborough after the Brexit vote was known and is fully committed to the UK market, irrespective of the status of the UK relating to Europe,” explained Simon. “There is very real belief in and commitment to both the concept of recycling and to the UK window and door market,” he added.